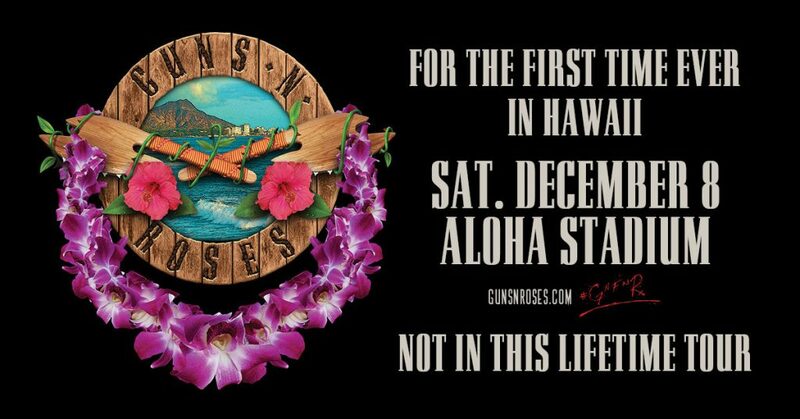 Guns N’ Roses and their outrageously successful Not In This Lifetime Tour have dominated the globe and are continuing the incredible whirlwind by announcing their first show ever in the state of Hawaii. The Southern California rock band will bring one of the most ambitious tours in rock & roll to the paradise city of Honolulu, playing for thousands of fans at Aloha Stadium on Saturday, December 8th. The historic show will be a can’t miss event for fans all across the Hawaiian islands and the entire west coast of the USA. Tickets are on sale to the general public starting Friday, October 12th at 10:00am HST at Ticketmaster.com and at the Aloha Stadium box office. Since kicking off the behemoth Not In This Lifetime Tour in 2016, the surly rulers of rock have brought the exhilarating phenomenon of a show to stadiums, arenas, and festivals around the world including North America, Europe, Asia, South Africa, Mexico, and more. It has become one of the highest grossing and most successful tours of all time. This year alone, the band has performed at 14 stadiums as part of the run and five summer festival headlining slots across Europe. In 2017, the first European leg of the Not In This Lifetime Tour sold over 1 million tickets becoming the year’s most successful tour, once again reaffirming the insatiable appetite for rock & roll. Produced and promoted by Live Nation, eager fans around the world have turned out in droves to hear the power of Axl Rose’s lethal vocals, searing guitar riffs from Slash, and Duff’s signature moody bass lines. Guns N’ Roses have performed sold out shows and headlined festivals worldwide following the critically acclaimed release of 2008’s RIAA platinum-certified Chinese Democracy. Six studio albums later, Guns N’ Roses are one of the most important and influential acts in music history and continue to set the benchmark for live performances connecting with millions of fans across the globe. Guns N’ Roses’ are Axel Rose (vocals, piano), Duff McKagan (bass), Slash (lead guitar), Dizzy Reed (keyboard), Richard Fortus (rhythm guitar), Frank Ferrer (drums), and Melissa Reese (keyboard).